characterized by its distinctive, upscale store design, is always strategically located for high volume sales. the strength of an established company name, and the alliance with an organization which can offer an inside line to profitable business practices. 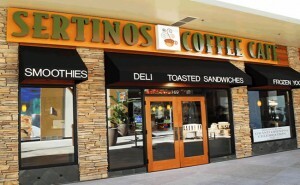 Sertinos Coffee is ready to serve a captive market. Favored by the country’s most respected malls, property owners, and developers, Sertinos Coffee is always in an optimum location. To complement Sertinos casual, inviting setting, Sertinos’ maintains the highest standards of quality of our coffee products – be they brewed or espresso coffees. Our trained roasters uphold the quality of our products by focusing on the flavor of each bean by hand-roasting small batches of select coffee beans. For non-coffee drinkers, our extensive menu caters to all customers’ tastes from tea drinks to hot chocolates to iced beverages like frappes and Italian sodas. promotes a Sertinos™ coffee house experience that will allow for repeat customer visits and One of the great advantages in owning a Sertinos Coffee Franchise is the over-support from your franchisor. the value of our streamlined operating system, low startup capital requirements and national discounts on equipment and fixtures. We continue, with a master plan for operations, marketing, and promotion, which is gladly ordered for your implementation.